Welcome to week 26 of our ongoing series about refined sugar & me in 2017. This week… well, the pound I lost last week came back, so I’m back to 16 pounds less than when I first started avoiding most added sugars and processed foods at the end of December 2016. In our ongoing science experiment here, this is also a commentary on how very quickly too many simple carbs and processed foods can mess me up: Last night I had a piece of this penne pasta bake (not a big piece; I cut it in twelfths) plus a toasted garlic hamburger bun with dinner, and this morning I woke up 1.5 lbs heavier and with a nagging headache. 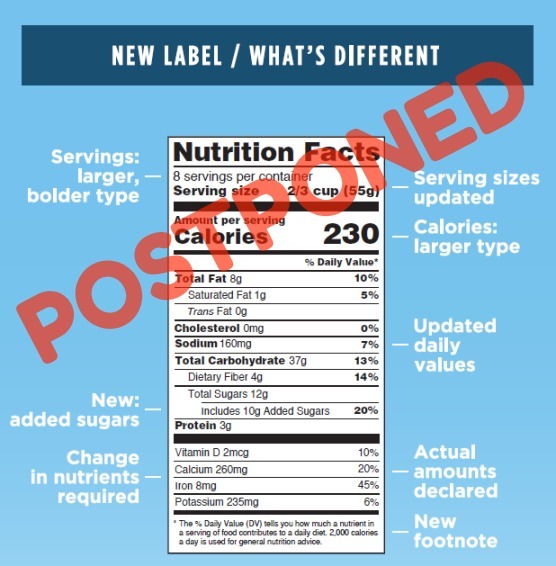 You may start to see some of the new nutrition labels already rolling out from companies that were in the middle of the compliance process before the postponement was announced. For instance, I noticed a couple of weeks ago that the packaging on the Clancy’s tortilla chips I buy at ALDI had changed. 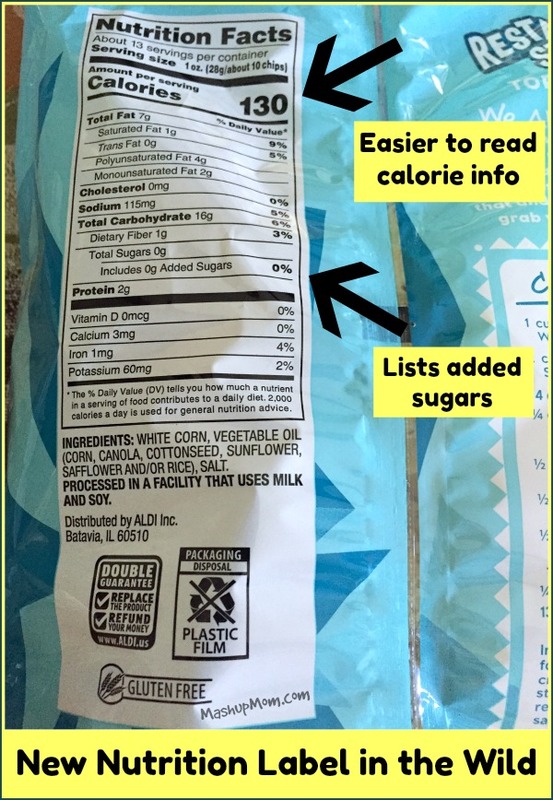 So, I just checked the back of the bag I bought and see that it now sports the revised nutrition labeling (as shown in the image at the top of this post). Well, go ALDI! It’ll be interesting to see if they continue rolling out the new labels now, and I’m going to keep checking during my shopping trips there. Who knows, however, when and if large scale compliance will now be required: Apparently industry groups are pushing for the deadline to be extended all the way out to May 2021. I was looking forward to the new nutrition labels to help make things easier for those of us looking to avoid added sugars. In the meantime, we can keep looking for various names for added sugars in ingredient lists; the higher up an added sugar is in the list, the more of it is in the product. With some products, one way to estimate added sugars as opposed to naturally occurring sugars is by comparing an unsweetened version to its sweetened counterpart (using the same brand as far as possible). So for example: I can look at an 8 oz serving of Silk organic unsweetened soymilk and see that it contains 1g of sugar; then look at Silk organic vanilla soymilk and see that it contains 8g of sugar. This tells me that Silk has added about 7g sugar per serving to the sweetened version, or almost 2 tsp per cup. This year is all about slowly figuring out my own pitfalls, it seems like, and mine may or may not be the same as yours. How are you doing on your own healthier eating plan so far — and what have you found that helps you stay on track? Read the whole Refined Sugar and Me series in chronological order (or catch up on any posts you might have missed!). Grrrr…the fact that the new labeling is now postponed has me mad! The food companies do not want the consumer to know what they are putting into the products they sell. We can keep reading labels and trying to figure out the coded sugar words in the ingredients. I appreciate you educating your readers on nutrition labels. That darn pound you gain and lose just won’t go away forever! Same thing happens to me. I’ve read that grain (corn, wheat, rice, barley, oats, etc) turn into sugar in our bodies. So, even though you eat a slice of non-GMO whole wheat toast, once it enters your body, it is converted to sugar. I think your body needs an added incentive to lose more weight. Perhaps limit your grain intake? I look forward to your next blog entry and see what is going on in your world. Thanks for the updates. I like reading your “Sugar and Me” posts. I have lost 15 pounds since the end of January. I’ve been involved in a weight loss group ,which motivated me. As part of the class, we have been asked to track our food consumption and exercise level on myfitnesspal.com. I have been exercising a lot, and so I am able to eat more calories and still lose weight. I also eat lots of fruits and veggies low fat dairy, and whole grains, and not a lot of meat or cheese. I hate low carb diets, and I could never live on one.Eating more fiber fills me up easier. I don’t totally eliminate sugar. I still put a small amount of sugar in my coffee, and have some frozen yogurt in my freezer right now. I love to cook though, and I do not have tempting food such as chips and cookies in my house. I have to show more restraint when I go out though. I don’t go out to eat a lot. I have been on this medicine since December that is notorious for causing weight gain, and so I feel happy that I have actually lost weight while on the drug. Rachel I think part of your problem is that your family still wants to eat pizza and chips, and it is hard to lose weight when you have those temptations around. I have heard wonderful things about weight watchers, but then you still have to deal with all the temptations at home.